Improvements by Annie and Jeff Aslan have resulted in Net Zero status for their KCLT home this year. Photo credit: David Johnston. Twenty-one KCLT homes have received free solar systems over the past four years. Photo credit: Jeff Bates. 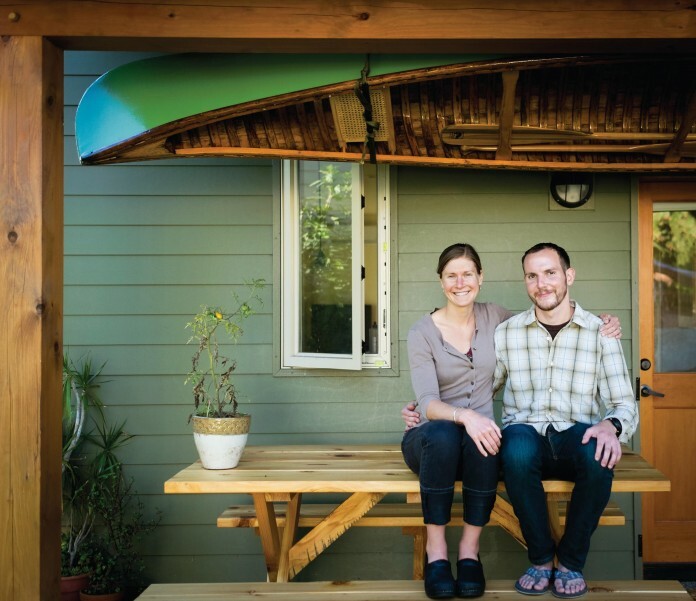 Since 1999, non-profit Kulshan Community Land Trust has placed 116 homes in trust, providing access to homeownership that low- to moderate-income working people can permanently afford. That has been no small feat considering that home prices in the area have increased more than 60-percent while median wages have only increased by 3-percent over the same time frame. In more recent years, Kulshan Community Land Trust has added an additional layer to its mission to aid the escape of those feeling stuck in the rental market. 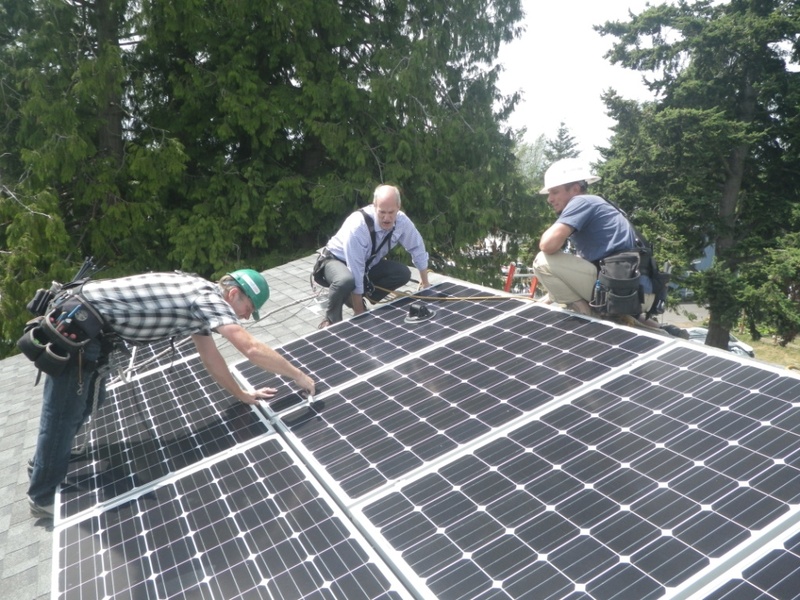 Through progressive environmental planning and fostering solid local partnerships, Kulshan Community Land Trust is now offering free solar technology to some of its homeowners. “Several years ago, we applied for a grant from a local person, someone who prefers to remain anonymous but supports renewable energy,” explains Kulshan Community Land Trust Programs Director, Christina Olson. “The first grant was to place solar on just one house with the intention that it might become the first Net Zero home in Whatcom County.” A Net Zero building is one in which the total energy used on an annual basis is roughly equal to the amount of renewable energy created on-site. 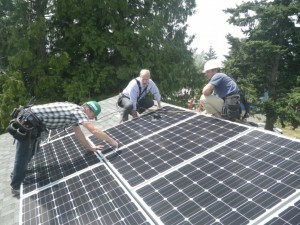 In 2012, Kulshan Community Land Trust placed solar systems on two additional homes while acquiring other grant funds to build two homes to Passivhaus standards, so energy-efficient that solar installation was unnecessary. “With those successes, we also wanted to help our older homes in the trust become more green and more sustainable,” notes Olson. 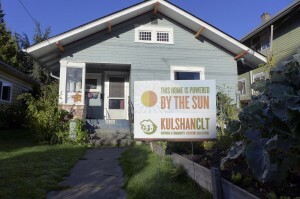 Last year, Kulshan Community Land Trust opened up the possibility of free solar systems to all of its remaining homeowners. “What Kulshan Community Land Trust is doing is pretty incredible, and we are so pleased to have been involved early on,” says Brandt. “The incentives also make this a great time for anyone to get into solar, even without the help of an anonymous donor. Available incentives include a one-time federal tax credit for 30 percent of the system cost through 2016, a state sales tax exemption through mid-2018, as well as the Washington State Production Incentive of $0.54/kiloWatt-hour available through 2020. Supply and demand has also brought down the overall costs each year,” she adds. US Congressman Rick Larsen (center) helps complete installation of new panels on a KCLT home with Ecotech Installers John Wilkins (L) and Yonk Reinemer (R). Photo credit: Ecotech Solar. In early July, US Congressman Rick Larsen helped with the latest round of installations by climbing onto the roof of one of two new infill Kulshan Community Land Trust homes locally designed by Greg Robinson and built by Cascade Joinery. Both homes were designed to meet Evergreen Sustainable Development Standards that balance energy efficiency and affordable new construction. That balance includes a smaller footprint, top quality insulation (R-value 28) and LED lighting. For more information about Kulshan Community Land Trust, visit Kulshan Community Land Trust online or call 360-671-5600.